Organic carob chips are frequently used as a substitute for chocolate when baking cookies, cakes, and other desserts. The sweetness and texture of carob chips make it a great substitute for chocolate chips. Not everyone loves the flavor, however, so be sure to experiment with your recipes to achieve the result you desire. Organic carob chips can be challenging to find but are sometimes available at your local health or organic food store in the baking goods or bulk sections. You can also find organic carob chips online. This company offers a huge line of spices and natural foods, including organic carob chips. Their raw chips are cold stored for flavor and freshness and can easily replace chocolate or cocoa in recipes -- simply use three rounded teaspoons of carob chips per each square of chocolate. Chips are available in a one pound bag for $12.99 plus shipping. Florida Herb House also offers roasted organic carob chips for an intense, rich flavor. These chips are sold in one bag for $12.99 plus shipping. Since true organic carob chips are very hard to find, making your own might be the way to go. The following recipe for organic carob chips is adapted from Whole New Mom and uses carob powder, coconut oil, and other easily obtained ingredients. Use only organic ingredients including organic carob powder to keep your chips all natural. Depending on your tastes, you may want to add organic cinnamon, salt or other spices for added flavor. Some recipes add chocolate extract for richer flavor. 1. Melt coconut oil over low heat in a heavy pan or double boiler. 2. Remove from heat, and stir in remaining ingredients (and any spices or additional flavorings desired). 3. Pour carob mixture into a foil lined, 8x8 pan and place in freezer. 4. Once the carob mixture is solid, remove from pan and place on cutting board. 5. Using a sharp knife, cut the solid carob into small pieces, resembling small chunks or chips. More importantly, carob has only one third the calories of chocolate, is high in fiber, and is virtually fat free. Comparatively, chocolate is approximately half fat. Carob's non allergenic factors are attributed to its lack of phenylethylamine (which can trigger migraines). Unlike chocolate, carob contains no oxalic acid to prevent the absorption of calcium and zinc. Oxalic acid is thought to be one of the substances in chocolate which may contribute to teenage acne. Some teenagers notice an increase in breakouts after the consumption of chocolate. Since oxalic acid can interfere with the uptake of zinc (an important mineral for clear skin), skin concerns may be well founded. Perhaps the most valuable selling point of carob is that it does not contain theobromine and caffeine, two stimulant substances found in chocolate. Carob's natural sugar content also means that you will have to include less sugar in your baked goods when substituting carob for chocolate. Ultimately, if you can adjust to the subtle taste difference, organic carob chips are by far the healthier sweet! Like chocolate, carob is made into small baking chips by combining carob powder with palm kernel oil and various other ingredients. 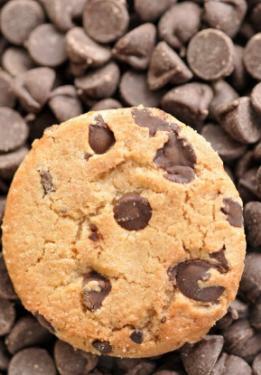 While it can be substituted cup for cup in baked goods, carob chips do not melt the same way as chocolate chips do. You can melt them in a hot substance like cream or soy milk to use in a recipe but it is very difficult, if not impossible, to melt them to be used as a coating for candy. Some people report having good results melting carob by using about a half cup of the chips with a teaspoon of coconut oil. When you use carob chips in muffins or cookies, there is no need to adjust times, temperatures, or ingredients. Some people find the taste of carob stronger than chocolate and prefer to use less chips in their recipes. Experiment a little to see what works best for you. Interestingly, carob is perfectly safe for dogs. Pet owners can feel comfortable making special treats for their pets that include carob powder or carob chips instead of chocolate. Some people will find that they absolutely love carob, while others may not feel the flavor is chocolaty enough. Try experimenting with different amounts and different brands of carob chips until you find one that you like. For some people, carob will never replace chocolate. These may be able to learn to enjoy carob for its own unique flavor and texture. 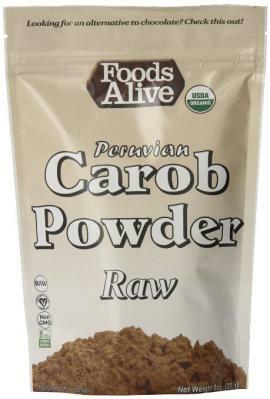 It may be possible to make the switch to carob by substituting it in recipes in increasingly larger amounts. At first you may substitute ¼ cup of chocolate chips for ¼ cup carob chips and then add a larger percentage of carob every time that you make the recipe until you are using all carob. While carob chips are not for everyone, they make an excellent substitution for chocolate for many people.